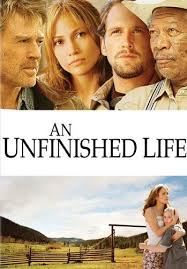 An Unfinished Life (2005) starring Robert Redford, Morgan Freeman, Jennifer Lopez and Becca Gardner is a story about living through pain. The story starts off when Griff (Gardner) and her mother, Jean Gilkyson (Lopez) are sitting at the breakfast table in their apartment. Jean’s boyfriend, Gary Winston (played by Damian Wilson of Band of Brother, Homeland fame) is apologizing to a beaten, battered and bruised Jean about his actions. When she fails to forgive him, he erupts and storms off. Griff begs her mother to leave — and they do, hitting the open road. Dreams of going wherever they want to start a new life, though, are cut short by the lack of money and an unreliable car. So Jean and Griff land at the Wyoming ranch of Jean’s ex-father-in-law, Einar Gilkyson (Redford). Einar is not pleased to see her and is even more irritated when he realizes he has a grandchild he has never met. His life, although not pleasant, is predictable and Einar wants to keep it that way. Einar and hired hand Mitch Bradley (Freeman) live out their days on the farm in vastly different ways. Einar milks his sole cow and piddles around the farm while the severely injured Mitch just tries to make it through the day. Although, it is a slow moving story, it’s worth the wait. You can tell early on that there is a lot of emotional, mental and physical pain each of the characters are forced to bear. The story is simple — how do people go on living well after an accident or a mistake forever alters their lives. As the story unfolds, it becomes obvious that some, like Mitch do it better than others and some, like Einar, choose to be bitter. With a heavy story line that has the potential to be overly depressing, the husband-wife writing team of Mark Spragg and Virginia Korus Spragg sprinkle in enough humor to lighten the story. One particular amusing scene is when Griff fixes lunch for Einar and Mitch. She nonchalantly blurts out that she had a lesbian teacher. The men, somewhat taken back by the randomness of the comment become amused when she reveals her assumption that they were a gay couple. Rated 5 out of 5. Perfect scenery, great characters — each one is interesting on their own — and enough resolution and closure to make the slowly unfolding story engaging, worthwhile, enjoyable and thought-provoking. DVD is available from Netflix, video stores or can be streamed from Amazon and other online services. Although the story is set in Wyoming, it was actually filmed in Kamloops — a city in British Columbia. The scenery gives the movie a rustic, almost ‘Robert Redford western-movie’ quality to it. The movie is based on the novel of the same name .